Developed by Mebius and published by Rising Star Games, Sadame is an action-packed RPG which feels somewhat similar to classics such as the Mana series, but with a much darker story! Does Sadame live up to the classics that defined the action-RPG genre? Continue reading our review to find out! 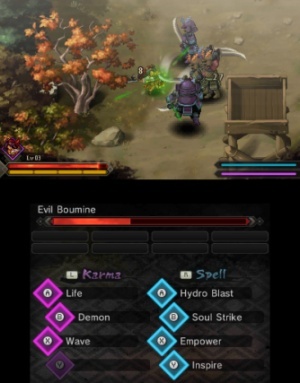 The gameplay in Sadame is extremely fast-paced and is definitely a part of the hack 'n slash sub-genre of RPG's. You can choose one of four character classes each with unique skills and techniques. These characters essentially share the same story, so don't expect four unique campaigns. 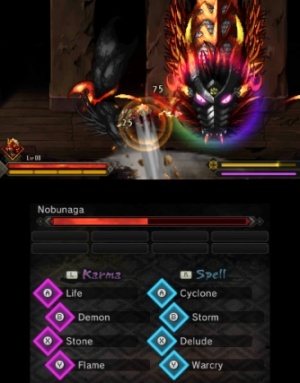 The several locations in the game are populated by many normal enemies and massive boss monsters that'll test your skills and even after you beat the game there's more to do. Overall the gameplay and story are fairly solid, though the latter takes a backseat to actual gameplay in this particular title! Also for some reason the game is really addictive and we haven't been able to stop picking up where we had previously left off on a daily basis! The controls are quite solid and as bizarre as this may sound even on a 2DS the game seems to possess some sort of a faux 3D effect though admittedly it's only slightly noticeable. The game's visuals are excellent, sure they won't blow players away, but the art-direction is superb with very detailed characters and enemies as well as fantastic visual effects! The music is fairly memorable as well with some great tracks along with a few "meh" ones, but overall the audio-visual presentation is great! 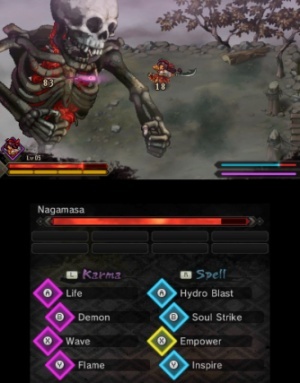 With solid gameplay that's highly addictive, excellent controls, and a great audio-visual presentation Sadame is a great 3DS game for fans of action-RPG's and as such we give the game a great level of recommendation! Beautiful review as always @Ichigofan! I agree that this game is addictive, but I don't know why lol. It's a 7/10 in my book. @Tech101 we summon you! I agree this game is extremely addictive. @Ragnarok, I'm not sure if @Tech101 will be returning to WiiWareWave. I think him and @RoryLee, @LTGamer, @Demonic, and @Soundwav all disappeared from WiiWareWave permanently. I was the one who originally asked all of them to register at WiiWareWave, but regular discussions never seemed to develop here. I believe they all communicate with each other via Miiverse or Skype nowadays, and I have no idea how often they communicate with each other anymore.